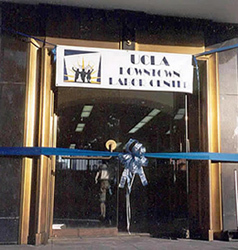 On Labor Day, 2002, the UCLA Labor Center (DLC) opened its downtown location on Park View Street overlooking MacArthur Park. The ribbon-cutting ceremony was led by Governor Gray Davis, Rev. Jesse Jackson, Miguel Contreras, three international union presidents, and numerous elected officials. Over seven hundred union members from the Los Angeles labor movement attended. A downtown office for the UCLA Labor Center had been a long-term dream of Director Kent Wong who commented, “It would be hard to find a better site for the Downtown Labor Center, located near the majority of LA’s union halls and worker centers and in the heart of a diverse immigrant community.” The DLC not only bridges the university and the Los Angeles labor community but also supports collaborative projects between unions, worker centers, and the broader community. The DLC houses a library, workstations for student researchers, conference rooms, and staff offices. The center occupies two floors of the building and provides a centrally located meeting space that is frequently used by unions and community partners and will hold up to 200 participants. In addition, the National Day Labor Organizing Network (NDLON), a grassroots organization working to improve the lives of day laborers in the United States, is based at the DLC.